A concrete monument still stands on a bluff on the Island of Barra in the Outer Hebrides, marking the place where the bodies of 348 victims of the wreck of the sailing ship Annie Jane were buried in a single pit in the fall of 1853. That wreck just off the coast of Scotland is still marked among the worst shipwreck disasters in seafaring history. While other wrecks may have claimed more lives, few have produced a story of the kind of terror and consternation experienced by this one. The Annie Jane was classified as a brig. That is she was a sailing ship with two main masts rigged for square sails, and with triangular, or schooner-type sails raised both fore and aft for greater stability and ease of handling at sea. 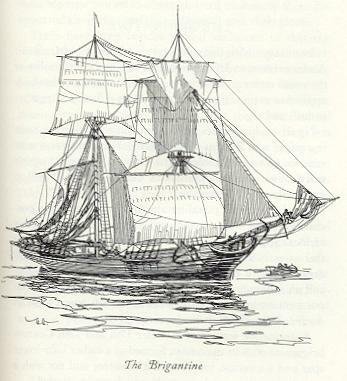 The brigs were popular in that era because they could be operated with a smaller crew than the heavier but faster clipper ships. Most brigs measured somewhere between 200 and 300 feet in length. This one was probably closer to 300 feet because she was carrying about 450 passengers, most of them emigrants heading for America. Also aboard was a crew of 45 sailors and a cargo that included railroad iron and barrels of beef and pork. The ship was sailing to Montreal, Quebec, from Liverpool, and following a northern route that took it just south of Barra Island and the archipelago chain. A large number of the passengers were carpenters and other artisans who were under contract to work at a public building project in Canada. There also were about a dozen cabin passengers that included men, women and children. The ship’s carpenter was forced to use his wits to raise any sail because, the story said, “there were no spars on board properly to replace those which had been lost.” This suggests that both masts were toppled by whatever disaster had befallen the vessel and the crew was using whatever resources available to rig temporary masts and beat their way back to the nearest port in either England or Ireland to find safe shelter and make repairs. The crew planned to run the ship ashore in an effort to escape the reef of rocks that formed at the opposite entrance to the bay. But without adequate sail, and with the gale blowing from the wrong direction, their luck ran out. The wooden vessel was carried by the storm right into the reef where it went aground, broke apart, and was soon destroyed by the crushing force of the seas. During those critical final minutes, before the Annie Jane hit the reef, the ship’s crew and many of the male passengers were standing on the deck, clinging to the ropes and rigging and “contemplating their fate” was it became clear that the vessel was being blown to its destruction. After the brig hit the rocks with a great crunch, many of the wives and even some of the children left their berths below deck to join the men on the deck. They were in the process of doing the only thing left for them . . . gathering around the davits to the life boats and preparing to try to escape the wreck and reach the island, which could be seen in the far distance, when a massive wave swept the ship. That wave struck with such force it carried away nearly everyone standing on that deck and even ripped the lifeboats from their davits. It was estimated that at least 100 people were swept by that single wave into the sea to drown. The few souls left on the deck were still secured by ropes or clinging to some of the attached fixtures of the ship. Meanwhile the passengers still below deck, who learned of the calamity that had just occurred, were afraid to leave the wreck for fear the same fate awaited them. As they trembled in fear in the darkness below, the ship was taking such a terrible beating from the onslaught of the waves, the cargo of railway iron soon beat a hole through the wooden hull, weakening the hull. When a second super wave struck, its force caused the central portion of the deck, including what was left of the main and mizenmasts, to collapse and crush the men, women and children huddled below. When they washed ashore people said their bodies were gashed and mutilated, giving evidence that they died quickly and did not drown. The few survivors by this time were taking refuge on the poop deck, which was raised high over the main deck. Seven other men secured themselves on the topgallant forecastle. These people miraculously survived because when the ship broke up the poop deck and forecastle were swept away intact, thus acting like rafts. They were carried by the seas right up to the shore of the island. Both groups staggered ashore at about 4 p.m. in the afternoon, some 15 hours after the ship went on the rocks. When the final count was made, there were 102 survivors. These included the captain, 28 members of the crew, 12 women and one child. Residents of the island gave the survivors shelter. Barrels of beef and pork that washed ashore from the wreck were used to help provide meals. The bodies from the wreck continued to wash ashore for days afterward. Because Barra Island is a large rocky place, with few trees, it was impossible for the people to make coffins and provide proper burials. Thus large pits were dug along the shore and the bodies were placed in them for mass burial. Only the first mate, a man named Bell, and a French Canadian priest, who were among the victims, were given coffins. These were roughly made from pieces of wood from the wreck.